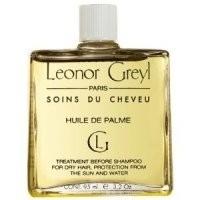 Leonor Greyl's Huile De Palme is a detangling, softening, protective and beautifying oil for the hair. Huile De Palme regenerates, softens and protects your hair from sea water, chlorinated pool water and aggressions from the sun. Hair is left softer, lengths and ends are well nourished. The perfect blend to protect and restore damaged hair. This product is designed to be used specifically for dry, very dry or damaged hair. However, it can also be used on all hair types if the product is distributed appropriately. Other benefits include: Waterproof - While swimming the hair is protected from contact with water to a temperature of about 77°F. Thus Huile De Palme stays on the hair in low water temperature. Prevents Dryness - Water moisturises keratin, sun strips natural moisture. Hair becomes dry, dull and split ends appear. Regenerates And Softens - The oils formulated in this product have been selected for their softening and regenerating properties. Before shampoo it detangles and softens the hair. Combined with Leonor Greyl's Creme aux Fleurs, this oil can be used as a conditioning treatment to restore health to the most damaged hair. Ideal for: All Hair Types, Sensitive, Dry & Damaged Hair. Pour a small amount (dime size) in your hands. Using your fingers brush through your dry length and ends. For optimal distribution, brush hair with a natural bristle brush. Use more if needed. Leave oil on your hair for up to 10 minutes or all night for a deep conditioning treatment. Wash out with a shampoo or treatment suitable for your hair type. This oil prolongs the life of your color and provides superior protection against the damaging effects of sun, seawater and chlorinated pool water. Reapply after three or four immersions in water. I leave it on overnight - it's pricey and I want to get the most of it, lol! I love hair oils in general, and this may be my fave of all oils I've tried. it really nourishes the hair! This solidifies in the bottle but after leaving it floating in the bathwater for a few minutes it melted into oil. "I leave it on overnight - it's pricey and I want to get the most of it, lol! I love hair oils in general, and..."